A cutout white metal design with glass inserts. 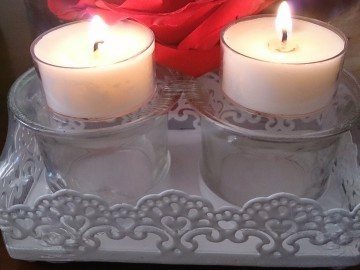 Includes two�soy unscented tea lights. Lovely small Christmas table decoration! Approx 7cms high. Add a six pack of tealights to your holder and save! Heaven Signature Blend - Cedarwood atlas, sweet marjoram, geranium, frankincense, lime, lavender, sandalwood and more. A woody, light scent with mild earthy, citrus and floral undertones. Hippy - Perfect for warm summer days, with a refreshing citrus aroma, combining patchouli and sweet Australian orange oil. Energy - Rosewood, peppermint, lemon myrtle, lime and more. An invigorating scent. Intimacy - Ylang ylang, patchouli, cedarwood atlas and lemon. Perfect for togetherness and harmony. Spring Revival - Sweet orange and vanilla combine to evoke a "spring is in the air" mood. Patchouli and Grapefruit - Our most popular skincare oils now available to scent your home! Quantity may be updated in the shopping cart.